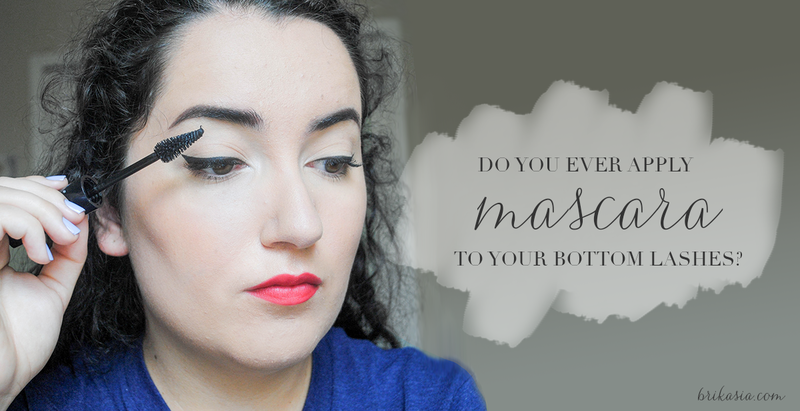 Do You Apply Mascara To Your Bottom Lashes? A few years ago, Clinique released a mascara made especially for your bottom eyelashes, which some touted as being revolutionary, while others thought it was a useless gimmick. I don't know about you, but I totally jumped on board with that gimmick and shelled out $10 for a tiny tube of mascara made especially for my lower lashes. And you know what? It was great. The mascara didn't smudge or flake off, and really defined my lower lashes. Fast forward a few years, and I just use my regular mascara for my bottom lashes, mainly because I'm just too lazy to buy a separate mascara for my bottom lashes. I'm really liking the Make Up For Ever Smoky Extravagant mascara. It really defines those bottom lashes and it doesn't really budge throughout the day. While I was talking to some of my girlfriends about mascara, several of them mentioned how they don't wear mascara on their bottom lashes at all because they just don't want to deal with the possibility of having raccoon eyes. I get it! I will admit that when I know I'm going to be out all day in the hot and humid weather, I'll skip the mascara on the bottom lashes, too. With all of that being said, what about you? Do you wear mascara on your lower lashes, or do you skip it? Or are you like me and just skip it when you know you'll be in the heat for a long amount of time? PS: Shop my favorite mascaras that won't budge on you below!